true norwegian black metal that can hold its weight with the classics. skin peeling lo-fi howl and furious breakneck blasts over cavernous and generally original-sounding riffs, if its pure filth and evil you're seeking look no further. 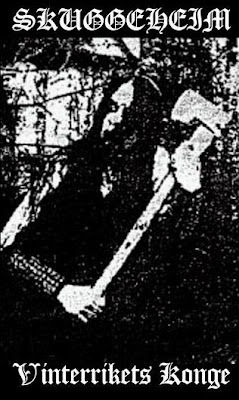 crocodile kenny tossed me a bone and gave me his extra copy of this tape, Skuggeheim's 2007 demo "Vinterrikets Konge" and even though i hadn't listened to it in a few months it still holds up as one of the best black metal tapes i've heard in a long long time, maybe ever. also, just because, their name translates to mean "shadow home". brutal.